2U 1*PCI-Express x16 + 2 x PCI-32bit/5V Riser Card. The PCI_E goldfingers linked with the middle PCI-Express riser connector is plugged to the 6th PCI_E x16 motherboard slot, the top PCI-32 riser connector linked with array-pins is connected to the 5th PCI-32 slot, the bottom PCI-32 riser connector linked w/a 8-wires paddle link is connected to the nearby 4th or 3rd PCI-32 slot. 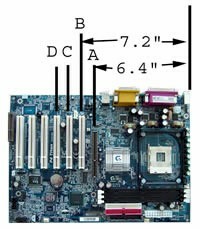 For Intel Se7525GP2,X6DAL Series, Gigabyte GA-81915P-MF,GA-81915G-MF,PDSG4/PDSGE, Tyan S2676, Asus P5AD/P5GD Series,etc. This PCI-Express x 16 Riser Card enables you to build a system with the highest graphics performance into 2U IPC Chassis. Your M/B must have PCI-Express slot in B position + 32-bit slots in C and D positions.